Vladimir Putin’s speech on March 1st revealed a number of seemingly new or emerging weapon systems, some of which were known to be in testing, while others may come as somewhat a surprise. However, most of these ‘new weapons’ are long running projects, systems thought to be in development, or testing. Some had not shown themselves in quite some time, while others have never been seen, although there were reports of their tests in public releases or official statements. The weapons represent a mix of hypersonic missiles, hypersonic boost-glide vehicles, traditional ballistic missile projects, and third strike vengeance weapons on the basis of Russian advancements in nuclear technology. Here I will briefly cover Kinzhal, R-28 Sarmat, and ‘4202’ – the rest of the more fantastical weapons will come in Part 2. But first, a brief comment on the overall presentation. The speech itself felt like a “послание” in more than one meaning of that word for those who speak Russian. It was certainly a ‘challenge accepted’ message from VVP, in part responding to the NDS and NPR. After a good run through new and seemingly fantastical capabilities, VVP returned to the subject of Russia’s military doctrine, nuclear policy, and the like. So, aside from domestic politics, there is a fair bit of coercive diplomacy in the message, from talking about the capabilities themselves, to Russian resolve, and concluding with assurances that all will be well if nobody gets into it with Russia. Moscow understands the audience well: nothing gets the attention of U.S. policymakers like nuclear weapons, and there is one person in particular in Washington who is readily impressed by videos of missiles. The graphics were not exactly Lord of the Rings quality, but what can you do, Russian MoD has to live with budget reductions since 2015. This was my overall impression listening to the speech and the vision it offered. Now, back to the missiles. A number of the more futuristic projects can only be characterized as semi-rational, in the sense that a fair bit of defense procurement is semi-rational. There was a need to support various design bureaus, Russia’s nuclear energy industry, and a long standing narrative about the need to penetrate a missile defense system the U.S. does not have (and probably after 30 years of copious amounts of funding still won’t have, because Russia is hardly the only country that suffers from semi-rational defense spending). There is no way to intercept Russian ICBMs, and with the upgrades to penetration aids they’re already implementing, Russia can ensure the viability of its deterrent for decades to come. This is not to mention recently deployed air launched cruise missiles like Kh-101/102. The ticket price of upgrading strategic nuclear weapons for better penetration, i.e. the offense, is just incredibly lower than the cost of trying to mount any viable defense. Statements on the various projects on March 1st can best be summarized as true lies, that is their stages of development are likely exaggerated, but none of what was said qualifies as science fiction either. Mainstream media coverage, and experts quoted have been rather dismissive of Putin’s presentation. That is an unfortunately common but foolhardy reaction, and its almost habitual. Observers are right to say that these technologies will take considerable time to test and deploy, but what some may not recall, because investment in Russian military analysis took a vacation 1992-2014, is actually when testing and development for these weapons began. The narrative of a sanctioned, economically weak and decaying Russia tends to prevail, but it comes with blinders on the issue of military technology. Yes, they can do this, and much of this may become reality in the 2020s. Recall awhile ago when Russian MoD leaked a slide on Status-6, many observers thought it was a PR stunt, and some kind of bluff, until it showed up in the NPR. Some thought T-14 Armata was a bluff, and made of cardboard, that ‘often wrong, but never in doubt list’ of expert dismissals is fairly long. The shown missile is a substantially modified version of the Iskander SRBM, with Mig-31 serving as the boost phase, providing a high altitude launch at supersonic speeds (recommend A. Ramm and Bogdanov for good reading). This is far from the first missile design to leverage Mig-31s performance in speed, takeoff weight, ceiling and combat range. Kinzhal is an operational-tactical complex, able to reach hypersonic speeds, a 2000 km range – although some suggest it is closer to 1500 km. According to official statements this missile can reach mach 10 and can conduct high-G maneuvers on terminal approach. I’m skeptical of the former, that is it likely can do mach 10 at early stages of flight, but then reduce speed for terminal maneuvers. The latter makes sense, because OTK 9M723 Iskander SRBM was designed to make random maneuvers in order to make its flight path difficult to intercept. Kinzhal is quite shorter, with smaller control surfaces, and a narrower nose. Gen Sergei Surovikin, head of Aerospace Forces (VKS) said the designation for this missile is Kh-47M2 (although earlier forum sources put it as (9-С-7760 – missile, 9-А-7660 – complex). Iskander, referenced as 9M723, can reach 350-450 km depending on payload, if launched at supersonic speeds from high altitude it stands to reason that a modified variant can achieve a substantially increased range. VKS should be happy since Mig-31s are technically under their service arm, and one of the few types of aviation they actually control. This gives them a new standoff weapon, and better chances at an anti-ship mission. Kinzhal is new, but according to A. Ramm and others, the concept initially surfaced 8 years ago. It has since then been mentioned by experts like Pyotr Bukowski in 2017. Given Iskander-M is considered to be a dual-capable replacement for Tochka-U, though its principal mission is conventional, there is ample reason to believe that the same nuclear warhead can be deployed on Kinzhal. Guidance is an interesting question, supposedly it can actively home on targets, and has scene matching as well. How that comes together at hypersonic speeds is a question, but more than likely this weapon is capable of very complex flight profiles. At least it is advertised with different seeker heads, one for traditional air-to-ground work, and the other as an anti-ship weapon. Readers will recall that Raduga’s Kh-15 (AS-16 Kickback) aeroballistic missile from 1980s was allegedly quite fast, perhaps reaching Mach 5. Kinzhal might have more power than the original Iskander too. Russia’s MoD has plans to upgrade the current Iskander-M, improving range, so a Iskander-M2 is in the offing already for the ground forces. I’m skeptical of the claim that this weapon has already begun combat duty in the Southern MD, which sounds like a ‘true lie,’ but it is probably the closest to operational deployment among weapons mentioned. One should not be surprised to see this in Syria at some point. Rumor has it the new GPV 2018-2027 plans to upgrade up to 50 Mig-31s to carry this missile. 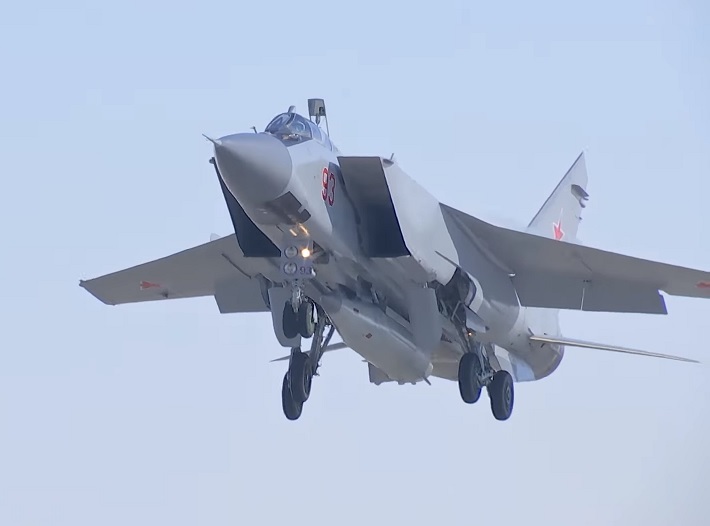 If anything, this weapon is ideally suited for the Pacific theater, where many Mig-31s are based, and in the anti-ship role, as it will prove incredibly difficult to intercept. I will add, there’s been no news of Tsirkon (a hypersonic cruise missile in development) since last year, principally for the anti-ship role. In 2017 everyone was advertising their goods to get funding in the new GPV, but since then Tsirkon has gone a bit quiet. Added another photo after more videos came out. R-28 Sarmat is a liquid fueled heavy ICBM designed to have high throw weight, deploying multiple warheads and numerous penetration aids. Although often touted as being a 200 ton replacement for SS-18, there’s a lot of conflicting information, some of it suggesting that its actually much closer to the weight of the SS-19, that is towards 100 tons. Earlier information suggested this was a 106 ton missile with a throw weight of 4350 kg. As a silo-based ICBM, SS-18 could deploy 10 warheads, but was designed and produced by Yuzhmash in Ukraine SSR. Hence Russia had an obvious problem, not only is this aging missile fielding a substantial percentage of the currently deployed force under New START, but it was still serviced and maintained by Yuzhmash. Currently, Sarmat is about 2 years behind schedule based on the contract initially signed in 2011. The last ejection test was in late December 2017, which seems to have gone successfully, with two more planned for early 2018. Sarmat features prominently in the new state armament program so there’s every reason to believe that it will be completed sooner rather than later, but in the end this is rocket science, not basket weaving. Suffice it to say, this missile is nowhere near serial production or operational readiness. Problems in Russian industry when it comes to missiles, rockets, and space lift, tend to stem less from S&T and more from production quality of complex components. This was at the heart of Bulava’s spotty test record. I’m also skeptical of the south pole trajectory shown in Putin’s address, implying it could be a fractal orbital weapon. In the end, we have to wait for the actual parameters of the missile to become public (100t or 200t ? ), because Russian officials have a long established problem with numbers – whether lies, truth, or self-PR, rarely does anyone in Russia give the same figures for anything. Sarmat is possibly the least interesting item shown during the weapons menagerie. More puzzling is that little has been said about RS-26 Rubezh, which has stayed out of the news for some time after initially being tested as an ICBM and classified as such. Russian MoD needs to do a ‘where are they now’ catch up segment on some of these systems. Gerasimov’s face during Sarmat video expresses how I felt. During the address, Vladimir Putin said that they couldn’t show the actual video of the rocket being used, and hence the name reference to Avangard is rather confusing. Avangard was a project mentioned back in 2011 by Serduykov and some sources incorrectly suggested it was based on a modified RS-24, which was made by MIT, whereas 4202 has been a well known hypersonic boost-glide program and is regularly mentioned as being tested on УР-100УНТТХ, which is made by NPO Mashinostroyeniya. The video during Putin’s presentation shows UR-100 (SS-19 Stiletto) as expected, besides being associated with 4202 – this ICBM also forms the basis for two successful space lift variants ‘Rokot’ and ‘Strela.’ The concept involves using an ICBM to boost a vehicle to near orbital speed, then it descents and adjusts flight profile at some altitude where there is still minimal atmospheric resistance into a sustained hypersonic glide, with the terminal phase being dive to target. First mention of Russia’s hypersonic boost glide program, and tests using UR-100, actually goes back to large scale RVSN exercise in 2004. This, like Kinzhal in 2008, is to give the reader some indicator as to how long these programs have been in progress so as to remove any confusion about the proposition that VV Putin ran out of things to claim and is now making all this up. USSR had ideas about hypersonic vehicles back in mid-1980s, so this is hardly a new concept. N. Surkov has a good article on the program here, adding that 4202’s flight control system was made in Ukraine, and needed replacing after the war. According to Surkov the vehicle is boosted to 100 km altitude and then glides down, perhaps at 5-7 km per second, those could be just official stats though, just like when Shoigu liberated 500,000 sq km of Syria. The idea behind 4202 is Russia’s version of Prompt Global Strike, except this system is intended to be an air defense penetrator carrying a strategic nuclear warhead. The vehicle being tested is analogous to U.S. Hypersonic Test Vehicle 2. Russia’s military continues to imagine a distant future where BMD is able to intercept their second strike, and therefore sees value in an expensive program to deliver nuclear weapons via a boost-glide vehicle. Although this threat perception is not too different from our oft advocated need for a new B-21 stealth bomber, since the current $2 billion B-2 is going to be defeated in some future where stealth is no longer viable. How Russians talk about the capabilities of U.S. missile defense to justify programs, and how Americans talk about Russian integrated air defense when it comes to B-21 and LRSO, has quite a bit in common. A. Ramm has one of the best articles with details on 4202. A R-36M2 silo (listed as object 370) is being used to test 4202 (the complex is often referenced as A35-71. The UR-100 in question, together with 4202 on top of it, fits into this R-36 silo because it is designed for a missile that is 7 meters longer. Earlier mention of Avangard on a RS-24 based missile seems incorrect, unless this is a different system altogether, but in my view 4202 and Avangard are the same. Ultimately R-28 Sarmat is the most logical carrier for this hypersonic vehicle. UR-100 is the current test missile for 4202, while Yars or Topol lack the throw weight for such a weapon, but because UR-100 is too old, it means that R-28 Sarmat is the only perspective ICBM ‘booster’ for this weapon when/if it is completed. Before anyone chimes in that these things take a long time to develop, remind them that R-28 contract was signed 2011, and 4202 began testing 2004. So perhaps we will be seeing both by the mid-2020s? Bottom line: there remains a strong emphasis on non-contact warfare, particularly tactical operational and operational-strategic weapons, along with dual-capable standoff systems. Even if the rationale of U.S. missile defense doesn’t hold much logic behind it, Russian leadership continuously thinks about a future where their strategic deterrent is somehow compromised, and this threat concept is rather convenient to justify a host of next generation technology programs, delivery systems and the like. Where there is capability in long range precision guided munitions the short coming often ends up being capacity. These are not bluffs, the question is less whether they can make it work and more of ‘how many can they afford.’ The upcoming GPV 2018-2027 will focus on increasing munition stocks and bringing to fruition several new standoff missiles – Kinzhal is just one among several projects. 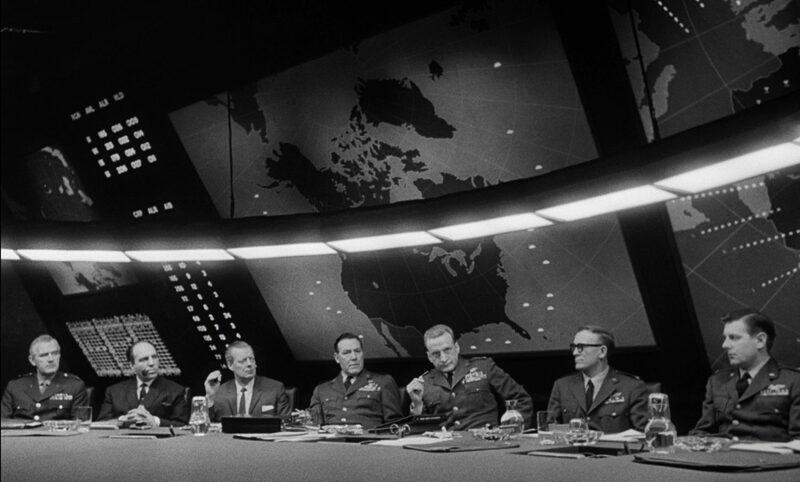 More in part 2 on Dr. Strangelove weapons. Beyond the bad graphics, there is a real vehicle somewhere in testing, though it likely has a long way to go. In conventional war, the US will have to bomb heavily Russia with cruise missiles and B-2 bombers in order to start a ground invasion and bring carriers near it. The problem here is that all US bases in Europe, the Middle East and S Korea/Japan will be destoyed by russian conventional weapons – Kinzals, numerous ground based Calibrs and enhanced Iskanders. Ships coming closer to launch cruise missiles will be vulnerable to the Kinzal, the russian planes that launch it can not be reached by carrier planes (too short range) while ground airbases will be destroyed by salvos of ground based cruised missiles and air launched cruise missiles. This only leaves submarines and military infrastructure far away from Rusia, such as that in the US, from where bombers can take off. In other words only submarines and bombers can be used, which will not be a lot, and will not be enough to destroy Russia in conventional conflict, especially in light of the fact that the russians are investing heavily in antiair defence, including cruise missile defence. And here comes the nuclear powered cruise missile. Just like the US will be launching cruise missiles in order to hit Russia safely, in the same way Russia will launch 20 000 km range cruise missiles in order to hit any object in the US (or US bases in Australia, or the Indian Ocean), in order to destroy US military and other infrasructure. So it sounds like a pretty good conventional deterrent to me – the russians can now bomb the US with conventional cruise missiles just like the US can bomb Russia with conventional cruise missiles, therefore inflicting large damage and destroying military and various other infrastructure within the US (powerplants, nuclear power plants, bridges, factories, oil depots, White House, Congress, skyscrapers, Wall Street, Fed, etc.) by conventional means. In other words, Russia brings the capability for numerous conventional cruise missile strikes everywhere within the US or in the world, increasing the costs for conventional warfare for the US, and decreasing the need for russian nuclear escalation. Thats quite new.